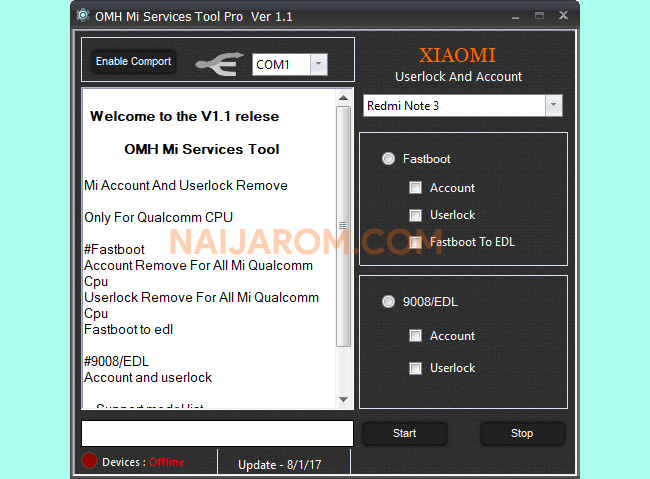 OMH Mi Services Tool Pro V1.1 is a small application for windows computer which allows you to service your Xiaomi MI Smartphone. The several features of OMH Mi Services Tool Pro includes Account Remove and Userlock Remove. It supports almost all models of Xiaomi Smartphones running on qualcomm chipset to remove or bypass the Account Lock and User Lock. It allows you to quickly bypass both the lock with the help of its simple and easy to use interface. OMH Mi Services Tool Pro supports MI devices running on qualcomm chipset only. It is a complete package to service your android phone. The tool comes with set of options to be performed under both 9008/EDL mode and Fastboot mode. In order to use the OMH Mi Services Tool Pro properly, you need to install the Universal ADB Driver on your Computer. Once Driver is installed you can successfully connect your Android Device to the computer, and launch the OMH Mi Services Tool Pro on the computer. [*] Credits: OMH Mi Services Tool Pro is created and distributed by OMH Min Htet (developer). So, full credits goes to OMH Min Htet (developer) for sharing the tool for free.